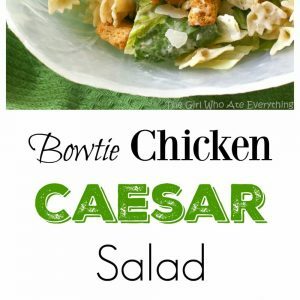 This Bowtie Chicken Caesar Salad is a great salad for a crowd. A way to bulk up a salad is to add cooked pasta to it! Try this Bowtie Chicken Caesar Salad and you’ll never go back. My church calling has kept me really busy lately. Every couple of weeks it seems like we have a stake function where we are feeding between 100 and 200 people. Only four of us make up the stake RS presidency so even though the food assignments are divided, each of us are still making a lot of food! This past week I was in charge of salad for 150 women. I remembered a recipe my cousin Amy had sent me a while ago for a salad that fed a crowd so I went searching for it in my emails. I made it 3 times last week: once for the missionaries, for the RS event, and then I made it for a BBQ. 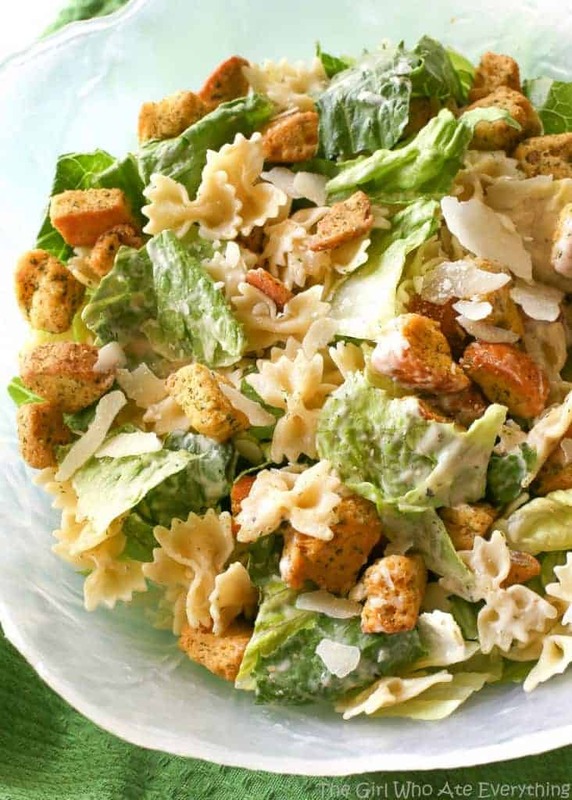 This Bowtie Caesar Salad has chicken, almonds, croutons, parmesan cheese and a little twist…bowtie pasta. People are always surprised to see it in a green salad. I like the addition of the pasta in the salad because it adds more substance and you can add more pasta to make the salad stretch. All the measurements are approximate…you can adjust it however you like. Toss all the above ingredients with Caesar dressing right before serving. Serves 20-25. 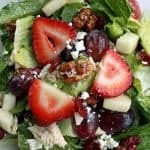 *I like Brianna's dressing because it is potent and you don't have to use a lot but you could substitute another quality Caesar dressing as well. I made this for a Halloween Party. I threw a half a teaspoon of black food gel in the pasta water to dye my bowties black so they could be “bats” in the salad. Also added a few carrots shaped like pumpkins on top. Took no time at all using the Brianna’s dressing as a short cut, which happens to be our go to prepared Caesar dressing in our house. 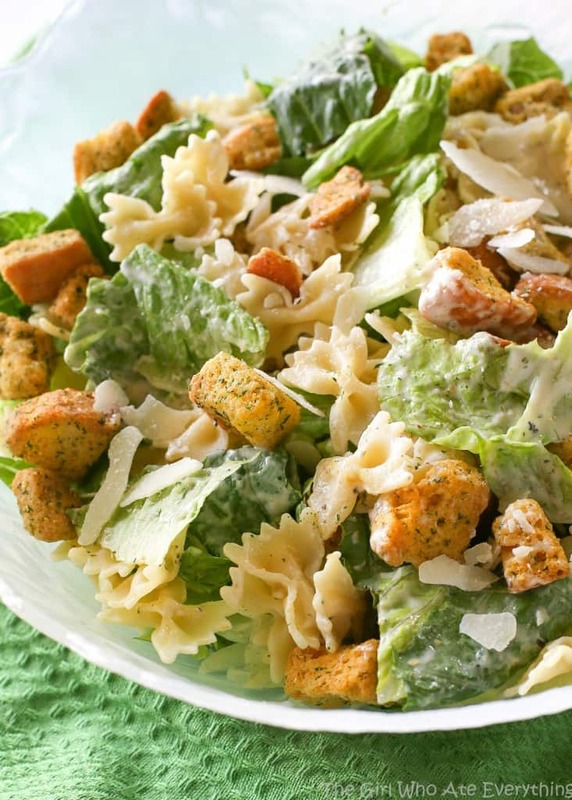 Thanks for the inspiration of adding pasta to a Caesar salad! Oh my gosh! So creative! Hi! 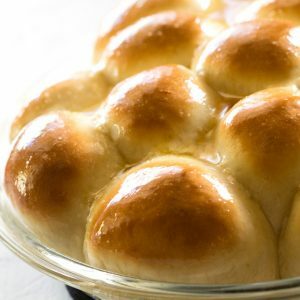 Stumbled upon this recipe and can’t wait to make it for a baby shower I’m throwing this weekend. 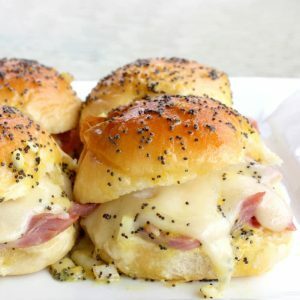 Curious, I can’t find the roasted garlic Almond Accents anywhere! I’m getting the impression they’ve been discontinued. I wonder what you use in place of that now? Fresh Gourmet seems to be the brand that has taken over in the grocery stores here. They’ve got a sea salt and cracked pepper flavor I thought to try, or perhaps plain toasted. 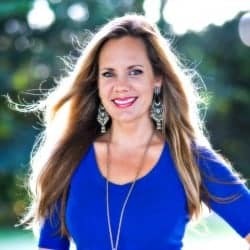 I’d love your thoughts! Thanks! Any almonds would work. I think the plain toasted would be good. Nothing over seasoned. Made it! Love it! I found the dressing – it’s delicious- tossed a little with the pasta. Since I made for my lunches this week, I stored everything separately as another person suggested (thanks!). I used sliced almonds for salads and didn’t have the Parmesan cheese but honestly didn’t miss it since the dressing has asiago cheese in it. 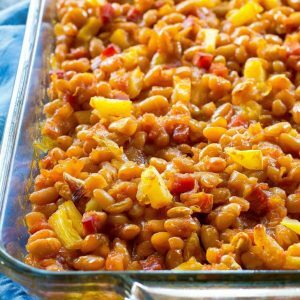 Great recipe – thanks for sharing! 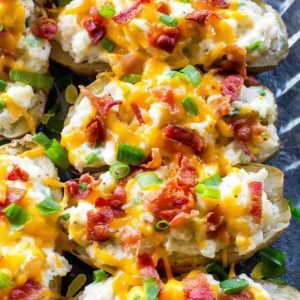 Can you please provide the nutritional facts for this recipe? I want to try it but need to know the calories and carbs etc. My husband and I love this meal (seriously, we eat it probably once a month). For any one who is looking for ideas, we add in some red onion and black olives as well and man it is good! Because we are only two people, we have lots of left-overs and have learned from experience to store everything separately, or it gets soggy. We take it for lunches in Ziplock baggies and then assembly everything right before eating. I thought this recipe looked interesting and easy, so I tried it. It was wonderful, so much so I had it two days in a row! I cooked the pasta earlier in the day, to save that step at the last minute, and just tossed it with a little of the Caesar dressing to keep it from sticking together. I also rubbed my chicken breasts with Montreal Chicken seasoning (found in the spice aisle) before I cooked it, it adds a little extra flavor. This is a great, light, one meal dish for company. I will certainly make it again. As a New Zealander and unfamiliar with the bag of Almond Accents/ Roasted Garlic Caesar, what is it please so that I can substitute. This recipe looks delicious. It’s just garlic flavored almonds. I made this today for a bridal shower, except also added sliced mushrooms and used slivered almonds that I sugared, and it was a huge hit!!! This is such a great salad!! Thank you – nice salas. 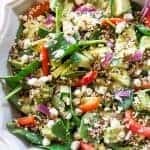 This is absolutely one of my favorite salad recipes ever!! I love this salad and love making it for us girls at the office. Its so easy to throw together and I cant wait to make this summer for cookouts! 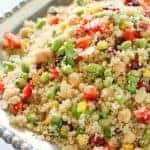 Its def best if made and served immediatly otherwise your croutons are not crunchy but either way, this is a great recipe! The second edition of The Principles of Beautiful Web Design has been expanded and revised, and is illustrated with full-color examples. It’s an easy-to-follow guide that will lead you through the process of creating great designs from start to finish. It’s just a store brand of Caesar dressing. I like Gardini’s as well. You can use any kind you like. 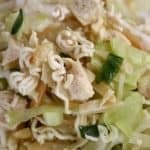 Bowtie Chicken Caesar Salad is very tasty recipie. i often eat this. and i cook it from this recipie. 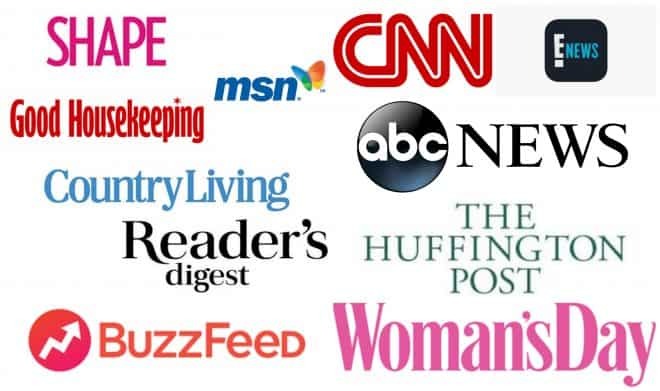 Where do we find the salad dressing recipe or is it store brand? No! The onion just gives it flavor when cooked with the chicken but you don’t use the onion. 2 bunches of lettuce is 2 heads of lettuce. Probably about 8 cups chopped leaves. Do you leave the onion in it? And what exactly is 2 bunches of lettuce?? Help! I l.o.v.e. this salad…i threw in some spinach, grape tomatoes, and sliced cucumbers as well. so good! Nice take on a caesar salad! This looks so yummy! I want some for lunch! Ok, Pizza Factory makes the best bowtie chicken caesar salad. I crave it all the time but we hardly ever go there. I guess I’ll have to start making my own now that I’ve got a recipe!! Thanks! I would make this but too busy stuffing my face with your Creamsicle cookies! They’re sooooooo good! So funny. I just made this salad last week for a RS luncheon. It always gets great reviews! I’m a little confused. Do you eat this hot or cold ? Cold. You cook and cool the pasta. Thank you. You’re sweet and I never will turn down recipes, especially awesome ones.